I was craving some tuna yesterday, but am a little tired of just putting it on salad, and was really trying to escape my toasted bread thoughts. 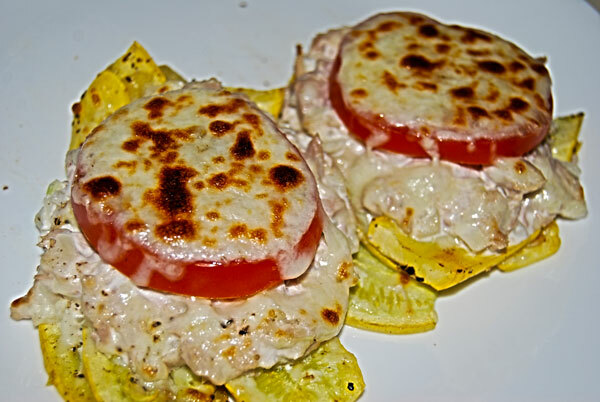 There was some leftover sliced yellow squash in the fridge – what a GREAT platform for the tuna, tomatoes, and cheese ! Combine tuna, mayo, and onions. Normally I would add a large stalk of celery (diced), but we were out. Sautee the squash over med high heat for a minute or two with a bit of salt and pepper. Don’t let it get mushy! Arrange squash on a baking pan into two “sandwich sized” platforms. Mound half the tuna mixture on the squash platforms. Layer on the tomato, followed by cheese. Broil for about 2 minutes, or until the cheese is melted and bubbly. yum. I’m gonna try this one out!